Denver, Colorado is a popular destination to visit year-round with a city full of great music, restaurants, and culture, and a multitude of activities surrounding the area. From whitewater rafting just 30 minutes into the mountains in Idaho Springs or catching a show at the famous Red Rocks amphitheater to checking out one of the hundreds of craft breweries in the city, there is something for everyone in Denver. To top it off, Kayak recently named Denver the #5 Most Wallet-Friendly Trip, leaving you not breaking the bank for a visit. With Denver International Airport just outside of town, there are plenty of direct flights from across the country. There are nearly 200 non-stop flights, with a handful of them international. According to flydenver.com, 58.3 million passengers travel through DEN annually, and it’s dubbed the 18th busiest airport in the world. Once in Denver it is easy to fill your vacation with memorable activities without stressing about your bank account. No trip to Denver is complete without some quality time in the Colorado wilderness. You can take a day trip to Rocky Mountain National Park, which is an essential stop for anybody who wants some breathtaking mountain views. Not quite as far are the Flatirons, right outside of Boulder, with endless trails for hiking. Perhaps you want to go to one of the beautiful resorts like Vail or Breckenridge, both of which have plenty of activities during both winter and summer. Hop on Interstate 70 and you’ll make it to these ski getaways within just an hour or two. Looking for a Rocky Mountain adventure without a strenuous drive? 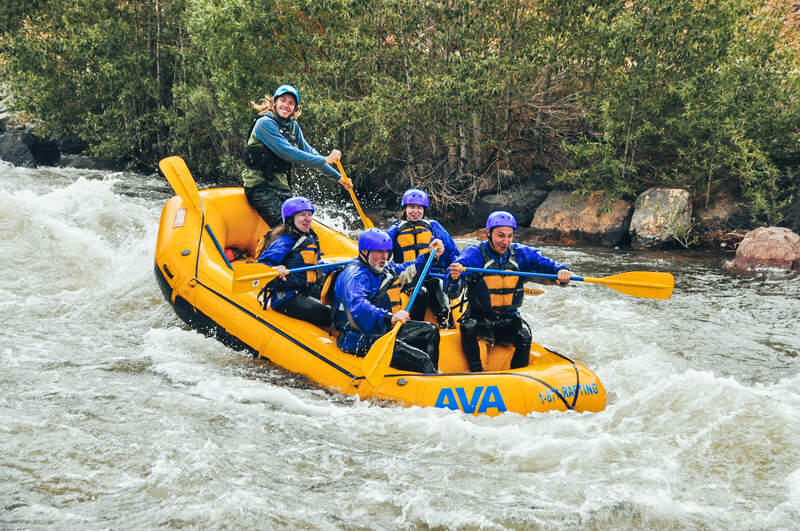 Idaho Springs, Colorado is located just 30 minutes west of the city, and is also home to one of AVA Rafting & Zipline’s outposts. Here, you can indulge in an introduction to mountaineering on the Via Ferrata tour, fly above the historic town of Idaho Springs on AVA’s Cliffside Zipline tour, and paddle all levels of whitewater on Clear Creek. Set aside an afternoon to venture through the mountains and see Colorado how it’s meant to be seen! AVA is currently running some great deals on adventures this year. Book now to solidify your spot and get the best price. *Featured image courtesy of Discover America.